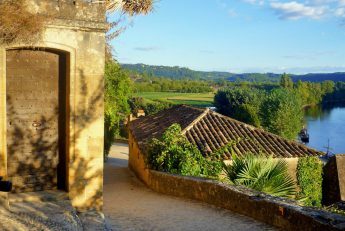 Holidays in the Dordogne – magical childhood memories! Growing up in England I was really fortunate to live a short drive from Portsmouth, a major ferry port in the South of England. I have the most wonderful memories of holidays in France where we would excitedly get on a ferry, often late at night when the city was all lit up, and set sail to the continent. I have 5 siblings and so it was always a fun, crazy time in the run up to the holiday that began days before, with packing, losing passports and then finally that lovely feeling when you drive up the ferry ramp and you realise that holidays have officially begun. Catching a ferry to France is a really lovely way to get to get across the Channel. I know that on paper a flight can look “quicker” but believe me, as someone that has flown a lot, this is rarely true. For a family it is so much easier to pop everything into the car and drive on and off a ferry. Night crossings are a wonderful way of travelling while you sleep and can mean less fatigue for the driver. Sometimes it pays to enjoy the journey a bit more rather than “get there” …whatever “get there” means because family holidays really are about every moment, including the journey. I could tell you some funny memories of long…very long car trips. My favourite is when we literally only just made the ferry to sail home. We literally drove on and turned off the motor whilst the ramp was being hoisted and then we were moving before we’d even left the car deck! It could not have been more of a near miss! Family holidays have framed my world more than I maybe realised at the time and have created memories which I treasure and hold onto even now thirty-something years on…. I’m not a big hoarder but in a small box of treasures I’ve kept some scrapbooks of holidays in France from when I was young. It makes me chuckle reading them and looking at the comments I wrote. There are numerous Brittany Ferries’ postcards and fleet brochures, sugar lump wrappers and restaurant bills, a now mouldy acorn and even a feather stuck into their pages. One of the best memories was standing outside on the top deck with my family as the ferry left port. It was magical… a new adventure was beginning. On the top deck of a ferry is where my love of France and French culture began and now finds me living in France, married to a French man with an Australian-French daughter. Who knows where holidays in France could take you! For our holidays in France we would book a holiday home “un gîte”, often with a pool, because let’s face it a holiday with 6 children would have been a lot harder without one. Destinations for our holidays in France varied but over the years we would usually sail from Portsmouth to Saint-Malo or to Caen. Although Caen or Le Havre are great for other destinations, the Saint-Malo route is slightly longer meaning you can get a better sleep on overnight crossings before driving in France on arrival. Some of my childhood holidays were in Brittany, the Loire, the Auvergne or the Dordogne. 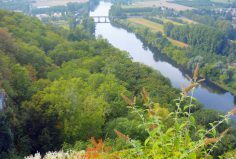 The options are endless but I have to confess that the Dordogne is still one of my favourite holidays and in particular the Périgord Noir area which is in the south of the Dordogne region. I’ve been back as an adult to the same spots and it’s still just as magical. So I thought it would be nice to highlight my favourite places to visit in Périgord….! 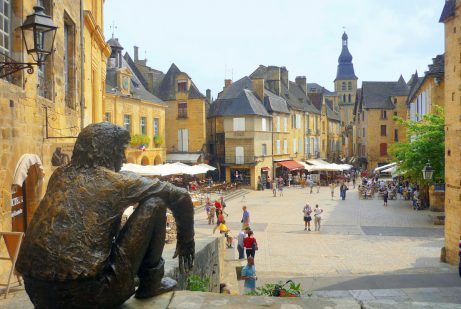 With a population of only 10,000 the small town of Sarlat welcomes more than 1.5 million visitors each year. This is not actually surprising when you consider the rich architectural heritage that has been remarkably well-preserved. I love strolling in the car-free streets bordered with honey-coloured limestone mansions and peeking into pretty inner courtyards. 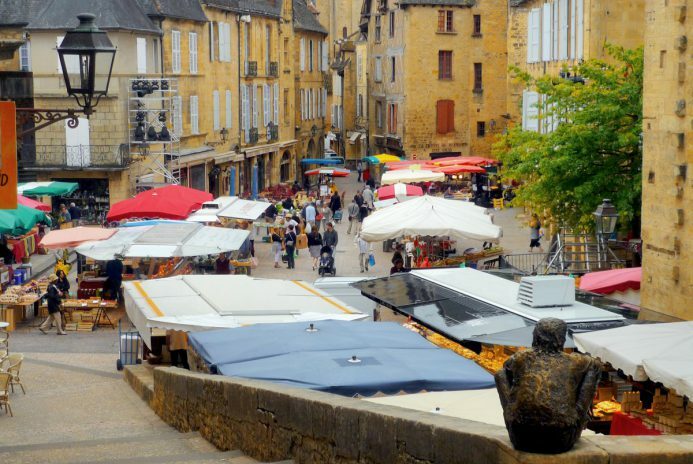 It goes without saying that you must also visit Sarlat for its wonderful markets. Click here for information on market days and times throughout the year. Make sure you stay at least 3 nights in this stunning town so you have to time to wander through its medieval streets, soak up the atmosphere and sample the local cuisine. 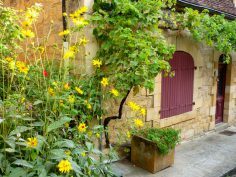 If you’re looking for a lovely B&B then try La Lanterne which is right in the heart of Sarlat up a little cobbled street. The owner will give you a very warm welcome and the rooms are beautifully decorated. We especially liked The Courtyard room. 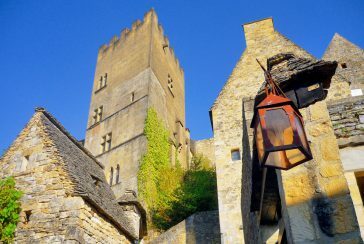 Stroll around the medieval village of Beynac-et-Cazenac 10km away from Sarlat and visit the castle of Beynac. The castle is open all year round and makes for a really interesting visit. 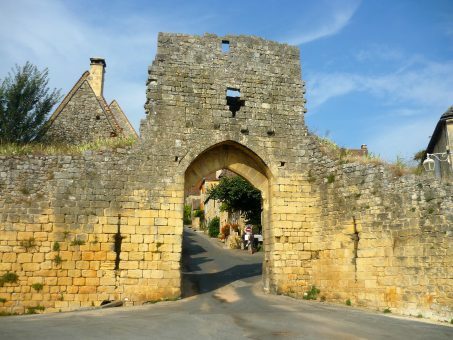 It was a key stronghold in The Hundred Years’ War with its strategic position overlooking the Dordogne River on the border of the English and French territories. You’ll be rewarded with an amazing view from the top. Tickets are available online. You can get a self guided tour document in English or a variety of other languages. Otherwise guided tours are provided in French if your language skills are up to it! 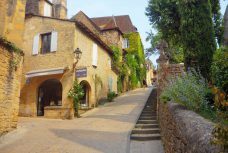 The village itself is very pretty and like La Roque-Gageac and Domme is also listed as one of the Most Beautiful Villages of France. For parking you have two options – the bottom of the village where it’s about a 15 minute walk uphill to the castle or drive up to the top carpark which is just a few minutes away from the castle entrance. Barge boat tours on the traditional flat bottomed “gabares” depart near the bottom carpark opposite the post office. 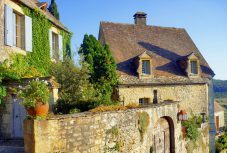 Throughout the 50 minute commented tour you will see the Marqueyssac gardens, the Château de Fayrac, the Château de Castelnaud and of course the village of Beynac. If you’d like to get a nice photo from the bottom of the castle then as you arrive in the village drive past Le Capeyrou campsite and you’ll see a green area on your left next to the river where you can stop and take a photo like the one we’ve featured above. GPS coordinates: 44.839175, 1.146623 on google map. If you are travelling with children and want to save some spending money then choose the morning for a boat ride with “Les Gabarres de Beynac”. Children are free of charge on 10am, 10.30am, 11am or 11.30am departures. 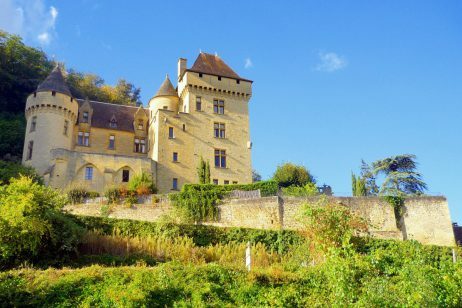 Opposite the Beynac castle, on the other side of the Dordogne River stands the Castelnaud castle which was often in the possession of the English throughout the Hundred Years’ war. In 1442 the French recaptured the fortress for good after a long siege. You can visit the castle all year round and make sure you check the current programme to see one of the medieval shows and displays. You can see a trebuchet in action although it is a third of the original size for safety reasons! Find out more information on their website. The village of Castelnaud-La-Chapelle itself is one of the Most Beautiful Villages of France and has some lovely little streets to wander through. If you plan on visiting the Marqueyssac gardens you can buy a combined entrance ticket for the Jardins de Marqueyssac and the castle of Castelnaud. It doesn’t have to be used on the same day and is valid for 1 year. 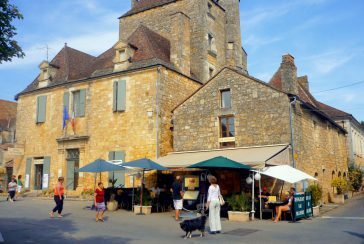 If you plan on visiting several Périgord castles and places of interest you might want to buy a Pass Visit Périgord. It’s basically a card which you charge up with credit and which gives you a reduced entrance rate off of a selection of attractions making it a bit cheaper as you pay a reduced entrance rate instead of full price. The ticket price is debited from the pass until all credit is used up. You can use it for several people at a time so good for families. More information here. This little village, awarded the prestigous title of one of the Most Beautiful Villages of France, literally hugs the cliff-side. 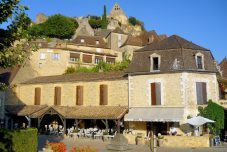 In La Roque-Gageac, you will find a row of restaurants, hotels and little shops on one side, the narrow “main” road and then the Dordogne River. Walk up near the church to visit the exotic gardens featuring palm trees, banana plants, fig trees, cacti and bamboo. We also highly recommend you take a boat ride from La Roque-Gageac on the famous “gabares”. A flat bottomed barge will take you up and down the river while you admire the amazing villages and views and learn more about the famous history between the French and English! Have lunch or dinner at La Belle Etoile, or even stay there. This family run boutique hotel and restaurant is a true gem. I ate here as a child on their terrace overlooking the river and went back as an adult not long ago. There is a different generation in the kitchen but still the same family and the food is excellent. You will find it in the Michelin guide and it has a very good reputation. These suspended gardens are exquisite and well worth a visit. For more photos look at the blog post we wrote a few years ago after visiting these gardens. In July and August go on Thursday evening for the candlelight nights (dusk to midnight). 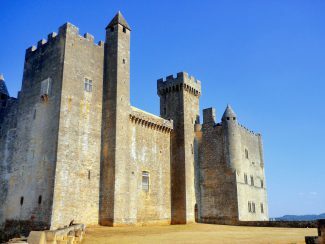 To get the best photos visit in the morning to have the right lighting for photos of Beynac and Castelnaud. If you like gardens you might also want to visit les Jardins d’Eyrignac which are 14km to the north-east of Sarlat. The Lascaux Caves were originally discovered in 1940 by four boys. What was uncovered was one of the greatest discoveries of the the 20th century. The caves were full of prehistoric paintings dating from around 18,000 BC. In 1963 the original caves had to close as the paintings were being damaged by the amount of visitors coming to see them. An exact replica of the caves was built a short distance away using the same materials and techniques to replicate the paintings. Lascaux II opened in 1983 and this is where you can see the preshistoric engravings and replica of the original cave. You will find the Lascaux caves at Montignac in the Vézère Valley, just 26km from Sarlat. Made famous by Josephine Baker this beautiful château is well worth a visit along with its gardens and birds of prey demonstration. You can find current pricing and information here. They also have some great children’s workshops where little ones can become falconers, dress up and hold exotic birds. (Ages 5 and up). Make sure you book if you want your children to attend one of these events. 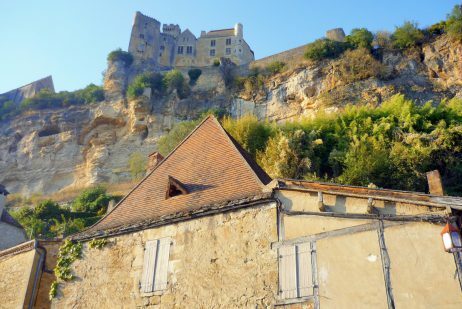 The historic village of Domme is perched atop a cliff which dominates the Dordogne River at 210m high, hence its nickname “Acropolis of the Périgord“. King Philippe III founded the bastide in 1281 and it was coveted by the English during the Hundred Years’ War. The fortified town repeatedly changed hands between the French and the English until 1437 when it was captured by the French. 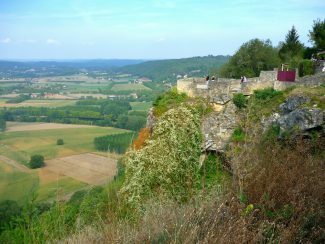 From the “Belvédère de la Barre“, you’ll be spoilt with a fine view over the Dordogne Valley from Montfort to La Roque-Gageac. Awarded The Most Beautiful Villages of France status, Domme really is a stunning village. Arrive early to secure a parking spot as like everywhere else in this region it does get pretty busy. The Padirac cave (or Gouffre de Padirac) is a 100m deep chasm which is one of the most amazing natural sites to visit in France. It was first explored in 1889. Visitors access the bottom of the chasm via a lift or a staircase. From there you’ll explore the cave partly on foot and in a boat. Wear warm clothes (average temperature below ground is 13℃) and comfortable non-slip footwear. 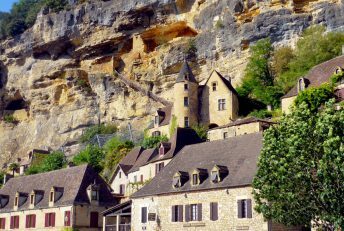 Found in the neighbouring region of Lot, 50km from Sarlat, Rocamadour looks like it is carved straight out of the limestone. It became a famous place of pilgrimage in the 12th Century. Pilgrims would climb up the 224 steps on their knees. It is a fortified town seeped in history and there is lots to look at as well as the incredible views. It’s a bit of a drive but worth a day out and if you leave early you can also visit the Padirac Cave on the same day. It’s a little bit further afield (68km from Sarlat) but if you want to see some authentic prehistoric paintings then this is the place to go. If you are planning on visiting (especially in July and August) then they highly recommend calling at least several days before or use the online booking facility to reserve your tickets for a specific day. To ensure the caves and paintings are conserved they limit visitors to 700 per day. Click here for phone information and how to book. Foie gras, duck confit, duck breast (magret de canard), pommes de terre sarladaises (basically potatoes cooked in duck or goose fat with some salt, garlic and parsely – divine!). Wine: Local red and white Bergerac wines and the sweet Monbazillac wine which goes beautifully with foie gras. There is a local wine producer in the Périgord Noir called Vin de Domme which produce some quality wines. Open from the 3rd April to 2nd September Mon to Fri: 10h-12h and 14h-18h30. Sat, Sun and public holidays: 14h30 to 18h30. 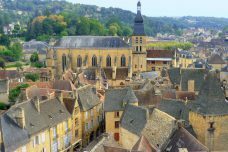 Don’t miss the truffle festival if you are in Sarlat in January! Farm visit: Visit a farm where they produce foie gras and other local delicacies. Friends of ours went here and enjoyed visiting the farm and seeing how the geese are raised. “Gavage” (force-feeding) can be a bit controversial but if you are a fan of foie gras then this outing is for you! A 1 hour free visit is available everyday in July and August at 18h30. Monday to Saturday rest of the year. Maze – A perfect outing for all the family … get lost in a corn labyrinth and then find your way out with the help of clues. There are two in the Périgord Noir area : Labyrinthe de l’Ermite and Labyrinthe de Maïs des Châteaux. Try to avoid July and August if possible, but I know with school holiday dates this can be tricky. If you have the choice then May, June, September and October are nice months too. It can get pretty hot in the Dordogne so if you do find yourself there at the height of Summer we suggest getting out early and then relax by the river or in your holiday accommodation in the heat of the day. You can always head out again when it starts to cool down for dinner and an evening stroll! For something more gastronomic check out the Michelin rated restaurants near Sarlat. Otherwise we recommend checking TripAdvisor for reviews and to find a restaurant that suits your mood and budget. Some restaurants will have children’s menus but not always. Usually restaurants won’t mind if you get an extra plate for children to share a main or have some of yours. French children generally eat the same as the parents. Lunch is generally 12pm-2pm. In the evening restaurants don’t open till at least 7pm in France and even then you might be the only ones eating for a while. Restaurants often do two sittings in the evening so it is also common for people to make a later booking if they prefer. Make sure you reserve a table for more popular restaurants if you are travelling at peak season. At lunchtime you will usually get a better priced menu. A smaller menu offering is usually a good sign that dishes are fresh and “fait maison”. A large menu might suggest a tourist trap and that some de-frosting is happening behind the scenes! Look for local specialities and be a little adventurous. Even if it’s on the menu avoid burgers and tourist food. This region has incredible cuisine and it’s well worth being a little adventurous! 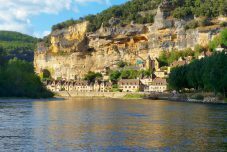 There is a great range of accommodation in the Dordogne, from luxury hotels to camping sites and comfortable guest houses. 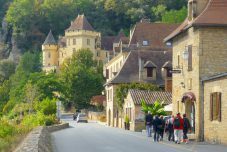 There are so many amazing things to do in the Dordogne region that it’s hard to list them all, but hopefully this blog post has given you an appetite for this region (and duck 🙂 ) Have you been to the Dordogne yet? Do you live in England and use the ferries to get to France? We would love to hear about your favourite holiday experiences. Have a wonderful summer wherever you end up travelling! We would like to say “merci” to Brittany Ferries for sponsoring this article. Please note all opinions are our own.